Here we answer some of the frequently asked questions. Please be sure to click on the Blog link on our navigation bar. In the blog you can search for any keyword. The blog has extensive information on all of the gas, propane and electric tankless water heaters and all accessories. When you open a hot water tap, cold water enters the heater and triggers the powerful heating elements or burners. 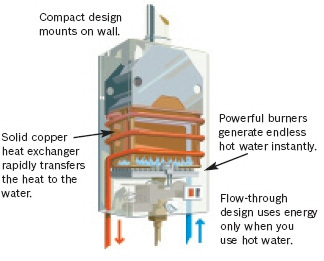 Your hot water tap acts as an ignition key for the energy used to heat the hot water you need.